Not all of the Reapers are such bad boys, are they? "For as long as I could remember, women have been throwing themselves at me. But that's not why I do what I do. I don't care about the fame or the glory or the women. I'm just trying to do what's right. I'll do everything I can to protect her... I'll do everything to keep her safe..."
"Ever since I've known him, Dorian was the man every woman wanted to be with. So tall. So strong. So handsome. He's always been the town's hero. Black Reaper. Firefighter. He's everything a woman could ever want. And that might be just too much for me to handle..."
Welcome to the small town of Ivory, home of friendly townsfolk, honest cops, and motorcycle clubs. SULLY is a STEAMY standalone MC firefighter romance novel featuring a bad boy biker and the woman he's trying to protect. 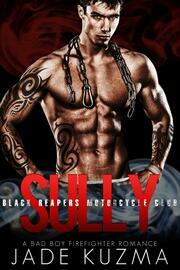 It's the third book in the BLACK REAPERS MOTORCYCLE CLUB SERIES but can be read as a standalone. It contains scenes of intense action, drama, and suspense. There are no cliffhangers and no cheating. Happy ending? You'll have to read to find out!